Canon 70D Experience is an EPUB e-book user's guide to help you learn to use your EOS 70D to its full potential. This is the EPUB version. PDF version is also available. 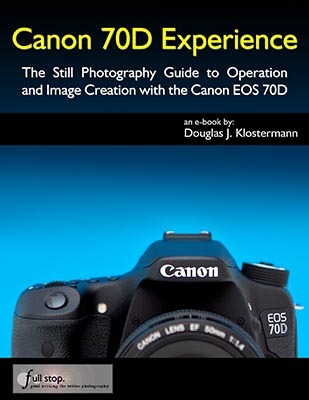 Canon 70D Experience - The Still Photography Guide to Operation and Image Creation (EPUB Version) is an e-book user's guide that goes beyond the manual to help you learn the features, settings, and controls of this sophisticated and powerful camera, plus when and why to use them in your photography. Written in the clear and concise manner of all Full Stop guides, Canon 70D Experience can help you learn to use your EOS 70 quickly and competently, to create the types of images you desire. Take full control of the versatile 19-Point autofocus system and new Live View-Movie AF system. To get you started, the guide includes explanations and recommended settings for all Menu settings and Custom Function options of the 70D. It covers basic dSLR camera functions and exposure concepts for those learning digital SLR photography, and explains more advanced camera controls and operation, such as using the various metering modes and exposure compensation for correct exposure of every image, and taking advantage of the newer features found in the 70D such as in-camera HDR and Multiple Exposure Modes, Wireless Flash, and Wi-Fi. For Experienced Photographers to get up and running with the 70D: This guide explains the new and advanced features and settings in order to quickly get you taking advantage of these capabilities. Plus it explains the camera controls, the in-camera HDR and Multiple Exposures features, in-camera image processing, introduces the HD video capabilities, Wireless Flash, Wi-Fi functions, and guides you through all of the 70D Menu and Custom Function items in order to help you best set up and customize the camera and its controls for your specific shooting needs. You can preview Canon 70D Experience at the following link. The preview shows the Table of Contents and Introduction, sample 70D Menu Settings pages, Custom Functions pages, Camera Controls pages, and sample text pages. Setting Up Your EOS 70D - Explanations of all of the Canon 70D Custom Function settings and Menu options, with recommended settings for practical, everyday use. These settings are a significant part of what makes the 70D such a powerful and versatile camera. Set up and customize the advanced features to work best for the way you photograph. Camera Controls - Description of all of the camera's controls, how to customize them for your needs, and when and why to use them. Aperture Priority (Av), Shutter Priority (Tv), and Manual (M) Modes - How and when to use them to create dramatic depth of field, freeze or express motion, or take total control over exposure settings. Autofocusing Modes and Drive Modes - Taking control of the EOS 70D 19-point autofocus system and Dual Pixel Live View autofocus system will enable you to successfully capture more still and action images. Learn the AF Modes and AF Area Selection Modes, how they differ, how and when to use them to capture sharp images of both still and moving subjects. Also how and when to use focus lock and back-button focusing. Exposure Metering Modes - How they differ, how and when to use them for correct exposures in every situation. Also how to make use of exposure lock. Histograms, Exposure Compensation, Bracketing, and White Balance - Understanding and using these features for adjusting to the proper exposure in challenging lighting situations or for capturing a range of exposures to combine into HDR images. Flash and Wireless Flash - Introduction to setting up and using the built-in flash or an external Speedlite, as well as taking advantage of the Wireless Flash capabilities of the 70D. Wi-Functions - Introduction to the set-up and use of the camera's built-in Wi-Fi. Use it to wirelessly control the 70D, plus save and share images via your computer, tablet, or smart phone. The Image Taking Process - Descriptive tutorials for using the settings and controls you just learned to take still and action photos. Composition - Tips, techniques, and explanations, including the creative use of depth of field. Lenses - Explanation of Canon lenses and choosing your next lens. Photography Accessories - The most useful accessories for day-to-day and travel photography including those specific to the 70D, plus recommended photography books. Introduction to Video Settings - Explanations of the menus, settings, and options to get you started shooting movies with the 70D. This digital guide to the Canon 70D is a 360 page illustrated e-book that goes beyond the 70D manual to explain how, when, and why to use the features, settings, and controls of the 70D to help you get out there shooting in the real world. A Pro Right There with You - If you want to get the camera up and running with the feeling of a pro right there with you then I would strongly recommend it. He walks you through setting the camera up and gives you his reasoning for the settings. He leaves the door open to change them based on your level of experience. After the basic settings tour Doug then gets down to the heart of this great camera: the custom settings and focus system. His explanation is first class and he explains how various custom settings are related to each other. The focus system on this camera is top drawer and Doug does a fine job explaining what can be a very intimidating area of this camera. All in all a great read. Camera in one hand and reader in the other and dig in. -Tim S.
Best reference book for Canon 5D Mk III - Well written and easy to understand. This book really helps one to be able to take advantage of all the features of the Canon 5D Mk III. A must have book for anyone new to the camera. -N.D.